I used vinyl ester resin on top of the 3D parts, used 4 coats, than i used sand paper to smooth out the surfaces, then i used 3M Polish 09639. Just the ester, paint brushes and polish cost me 150 euros. Excellent finish lan – and good color scheme as well, cant wait to see it completed ! 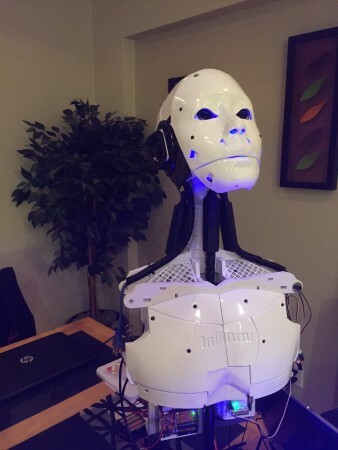 Amazing how life like InMoov is getting. and ones with teeth too ! 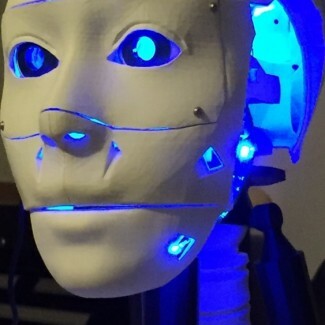 Hey Your InMoov has teeth!!!!! !……..keep him off the candy!. will you be releasing your design to thingiverse ?. great work ! Hi Gael – great info thank you.what is the consistency of the ABS slurry you use. your prints are look great. The slurry is almost totaly liquid. It’s hard to say how much percent of ABS and acetone. Maybe 20 to 30 percent of ABS for 100 acetone. Gael has not released the back covers for InMoov yet. That’s correct, the back parts aren’t released yet. I’m currently working on the legs which is taking a lot of my spare time. WOW! That finish looks great! Does the mesh connecting the clavicles near the neck get in the way of the shoulder pistons? Wow, nice finishing! How did you do it? Hey nice work, looks great!!!! 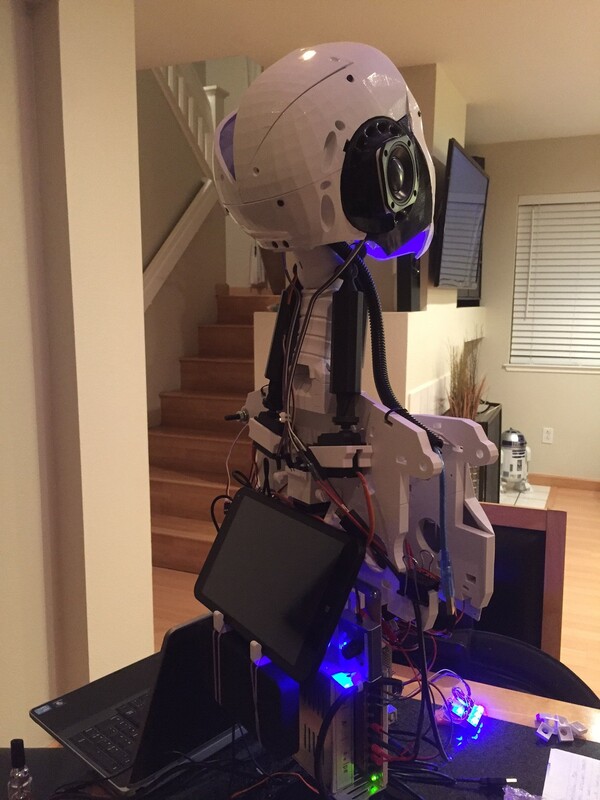 What are your plans for your “Desktop InMoov” ? If I decide to go this route, a camera will be mounted inside Inmoovs forehead. the color of the eyes can also be changed, red, cats eyes etc………..
Hi Gael – It is a Carbon fiber reinforced ABS mix. I must say it prints very very well. it wears your nozzle out though. I had to replace my nozzle after printing a 1000 grams of the filament. still well worth the price of a nozzle. I purchased from 3DXTECH in the usa. Hi Gael – yes the Eyes blink, the iris gets smaller or bigger depending on the light. you are the expert!….yes printed at 100 micron, then sanded and sprayed with car primer filler. I have printed all Inmoov in ABS and all the gears and pistons in carbon fiber(very light and strong). Hey we want a video of the eyes in action! Carbon fiber ABS or PLA? I have only seen carbon fiber PLA until now, but maybe it’s a new product. 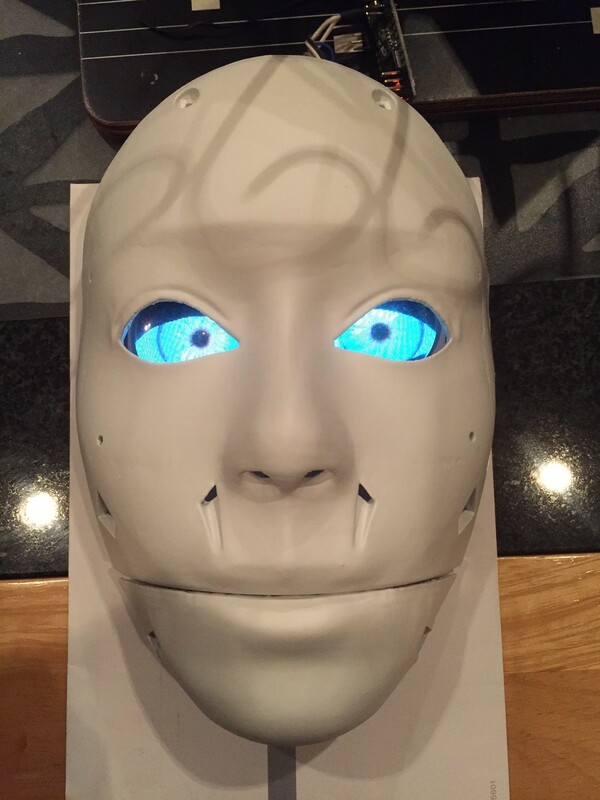 Trying out some OLEDS for InMoovs eyes. they react to noise and light too! Woooi, might be a bit scary for children!! But I see the point!! Does it blink the eyes lid? Nice finishing surface on your prints. Did you use car primer filler? Are you printing in PLA or ABS? It is what I do when I want a good finish job surface for to gunspray car paint. But it works easy on ABS, unfortunately the results aren’t very good on PLA. nice eyes. how can it see if they are screens? do you have a camera mounted somewhere else?